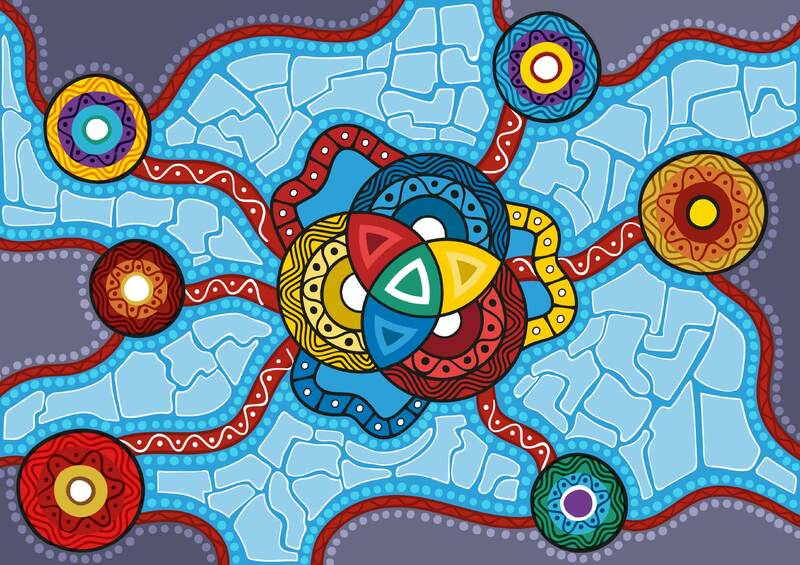 The artwork reflects the interdependence of prevention, care and after care to achieving the best health outcomes for Aboriginal and Torres Strait Islander people, highlighting the principles of the Consortium. The three central overlapping meeting places signify the across plan priorities of the 3 plans. Diabetes is depicted by the blue meeting circle; heart and stroke by the red meeting circle; and cancer by the yellow meeting circle. The red, blue and yellow paths show the three plans collaborating and coming together to achieve the best health outcomes and the red paths show the Consortium reaching out to other organisations and communities, represented by the outer meeting circles, which are working together to maximise the effectiveness of the three plans. The small dots are the people going to the organisations and communities and being assisted by the work of the Consortium, and the pale blue puzzle pieces represent the organisations and communities giving the Consortium important feedback. Jordan Lovegrove, Indigenous Artist, from Dreamtime Creative, has created our artwork. 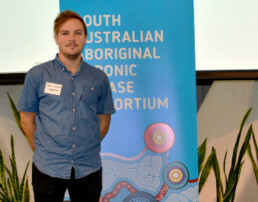 Jordan is a young Ngarrindjeri man who combines intimate knowledge of Aboriginal communities and illustration skills to develop outstanding Indigenous artwork.